I love the Advent season! 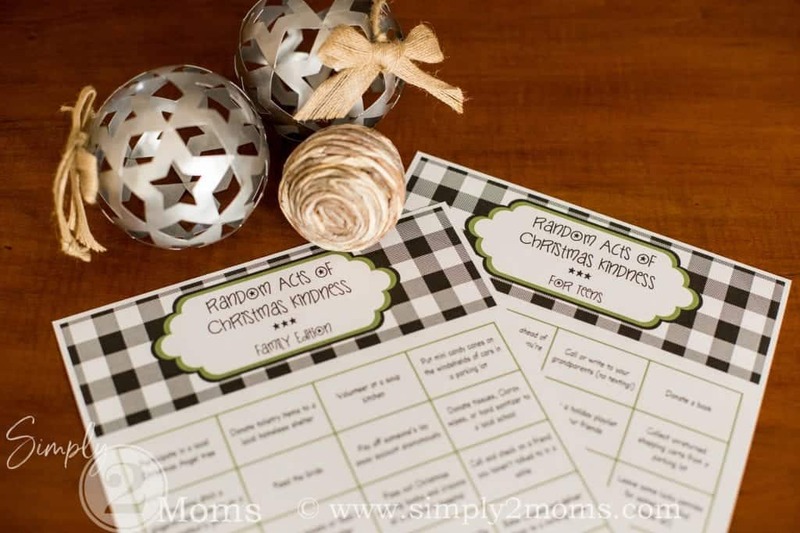 While it’s fun to decorate my home and find special gifts for loved ones, bake with my kids and attend all sorts of gatherings, the month of December is the time I like to prepare my heart for the celebration of Jesus’ birth. Doing things for others is a wonderful way to honor the true meaning of this season! 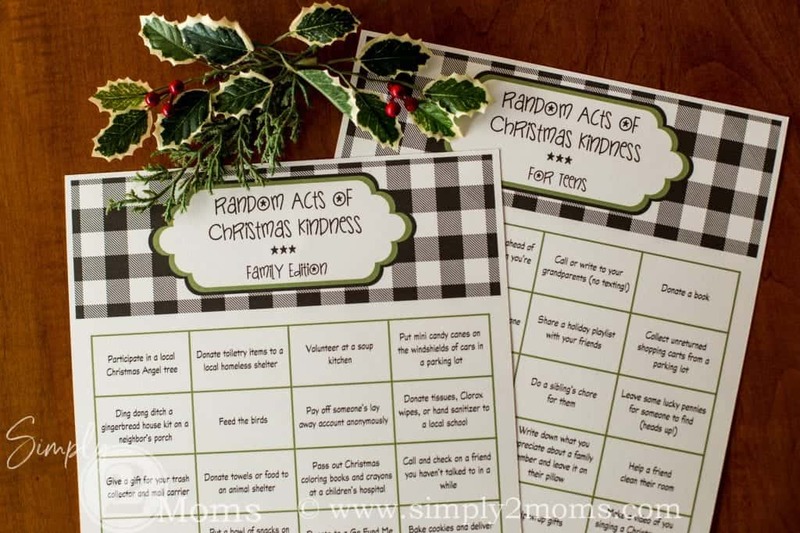 Introducing, Simply 2 Mom’s random acts of Christmas kindness (RACKs)! Counting down the days to Christmas has been part of my December for as long as I can remember. How about you? When I was young, I loved advent calendars. Waking up each morning and finding the right numbered door and enjoying a little candy was so exciting! We didn’t get a lot of candy in my home, so this was a huge treat! Our church always hosted a gathering to create an advent wreath for our homes. My family lit a purple candle the first three Sundays, and the final pink candle the Sunday before Christmas. It was another special way to mark the time before Christmas. And on Christmas Eve we ate dinner with all four candles lighting our table. But Christianity is about putting our faith in action. 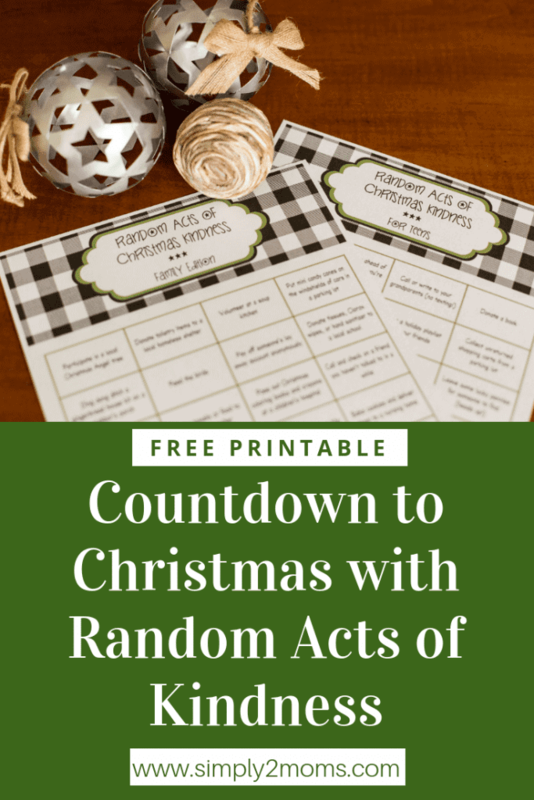 What better way to count down towards Jesus’ birth than by doing random acts of kindness for others? 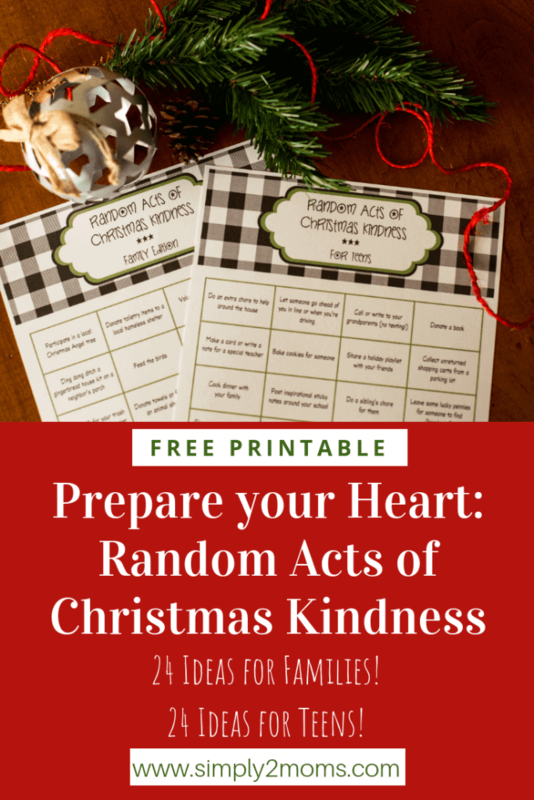 Enter the idea of random acts of Christmas kindness (RACKs)! There are so many ways we can do things to make other people’s lives a little better! Sometimes it can feel a little overwhelming though, can’t it? There are so many people who need help. And we only have so much time to do things. True confession: too many times I’ve become so overwhelmed by how many people are in need that I don’t do anything. Have you ever done that? 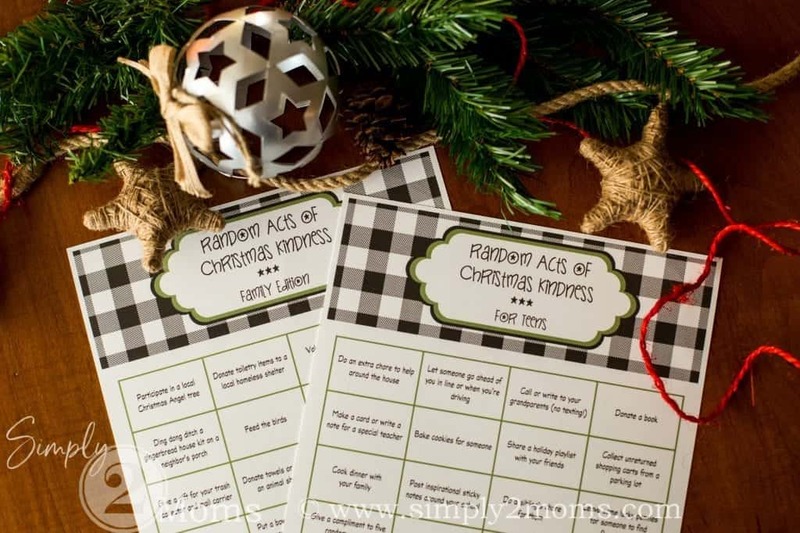 But what if there’s one small task you can do each day during the Advent season? Already planned out. 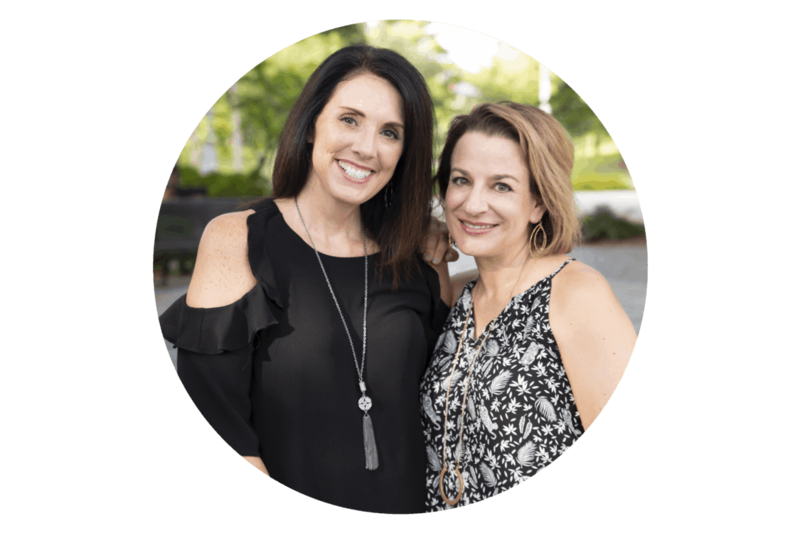 Instead of being overwhelmed by all the different things that could be done, just focus on one thing to DO! 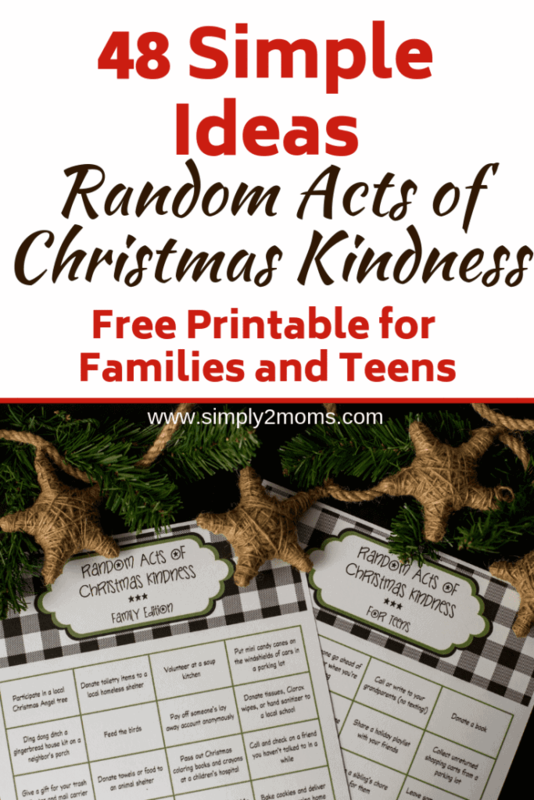 Doing random acts of kindness (RAKs) during the Christmas season is great for families to do together. But what if your kids are older? Teens are pretty independent. While they may enjoy doing some of the family activities, they also enjoy doing nice things for other people on their own. This is a wonderful way to empower your teens to experience the true meaning of Christmas on their own. 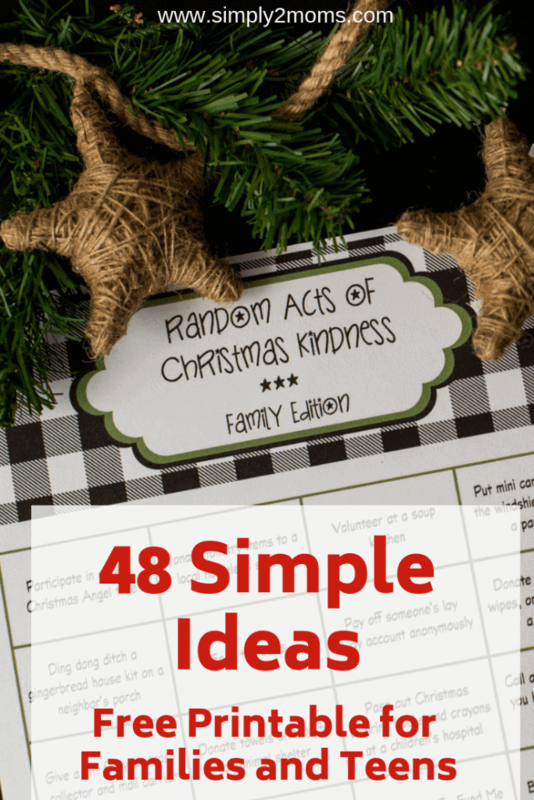 AnnMarie and I have brainstormed and combed through ideas for random acts of kindness and compiled two lists: one for families, and one for teens. We debated making calendars with specific tasks on certain days, but everyone has different schedules! We were afraid that assigning tasks on specific days may make it difficult for you to participate. So instead, we came up with 24 ideas for families, and 24 ideas for teens. Some of the ideas are quick and easy, and others may take a little bit more effort. There are enough ideas that you can do one each day leading up to Christmas if you choose. 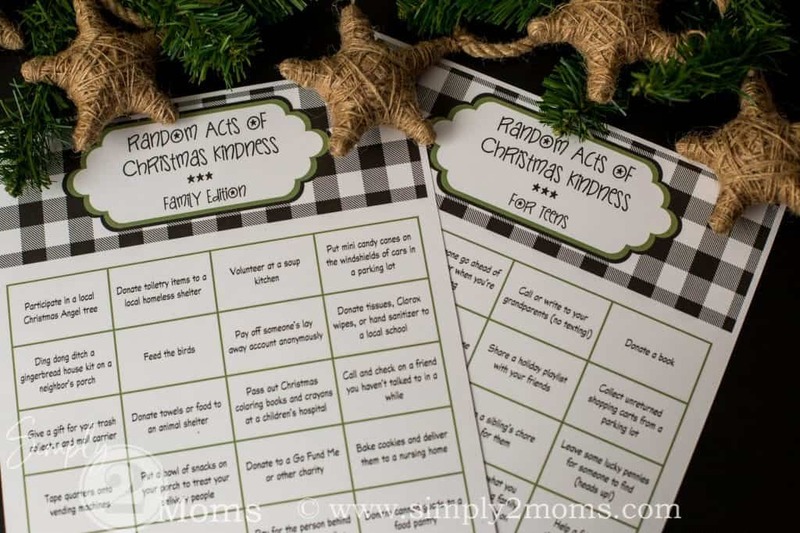 Sort of a random act of Christmas kindness (RACK) advent calendar! Or select a few activities and do them when you can. Either way, you’re putting your faith in action. And you’re making our world a better place, one random act of kindness at a time. We would love it if you take pictures when you do some of the activities on our lists! Post them on Instagram and tag us with @simply2moms or use the tag: #s2mRACKs. Or post them on Facebook and tag us with @simply2moms! It would be so exciting to see the impact we are all making on our world together!